I was so mesmerized by the pink rose cake I made a month ago, that I quickly wanted to bake another flower cake. 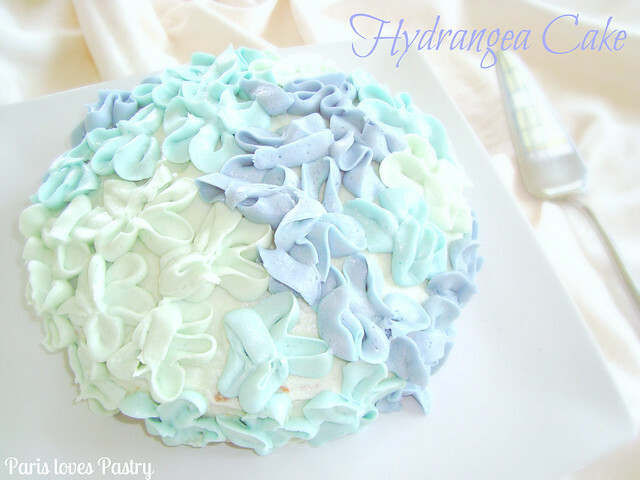 This time a hyndrangea-flower cake. Again, I got the tutorial from i am baker. 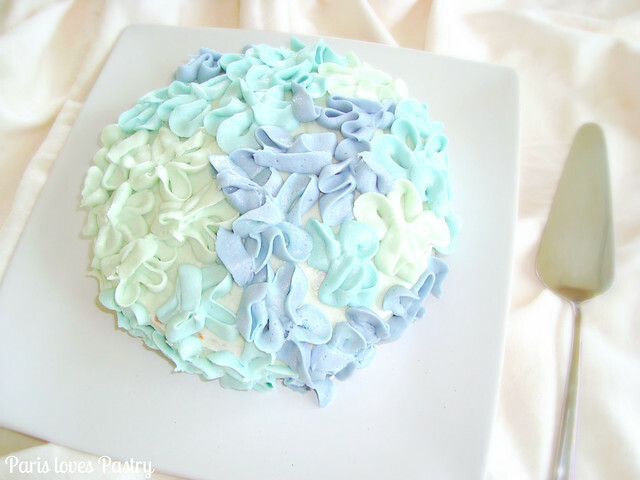 My cake isn't nearly as beautiful as hers, in fact, I think mine looks like blue tagliatelle pasta on top, but that doesn't make the taste any less fabulous. This cake was a little bit more difficult to create than the rose cake. You need a #104 Wilton tip and the frosting needs to be quite thick. 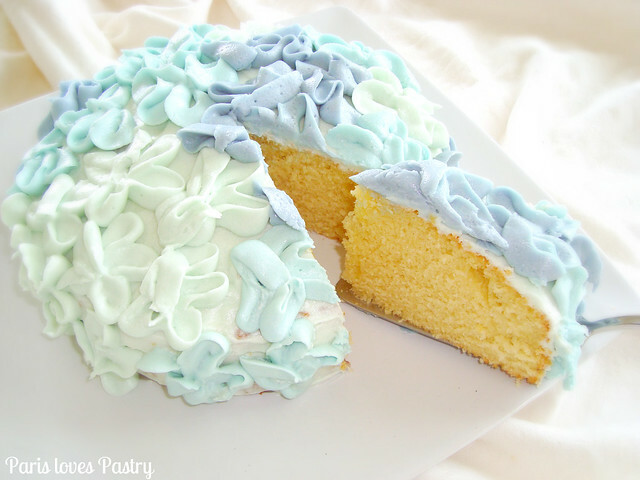 The recipe is a light and delicious vanilla cake from Martha Stewart, the buttercream frosting is from Magnolia Bakery. Rating: 5 out of 5. - Preheat oven to 350 degrees. Butter and flour a 9-inch round cake pan. In a small bowl, whisk together flour, baking powder, and salt; set aside. Combine milk and butter in a small saucepan; set over very low heat. - With an electric mixer, beat eggs and sugar on high speed until thick, lightened in color, and mixture holds a trail for several seconds when beater is lifted, 4 to 5 minutes. Gradually whisk in dry ingredients just until incorporated. - Bring milk and butter to a boil. With mixer on low speed, add hot milk mixture to batter; mix just until smooth. Mix in vanilla; transfer batter to prepared pan, and smooth top. - Bake until golden and pulling away from sides of pan, 35 to 40 minutes. Cool cake 10 minutes in pan; remove from pan, and transfer to a rack to cool, right side up. Buttercream recipe here and cake tutorial here. The cake looks so sweet. I love the color combination of the lavender and blue- so pretty! That's so pretty - I love the different shades of blue! So pretty and looks delicious, I would have a tough time making that first cut! The cake looks soo pretty! this almost looks too pretty too cut. Greetings! I've been following your site for some time now and finally got the bravery to go ahead and give you a shout out from Porter Tx! Just wanted to say keep up the great work! I love it! It looks to pretty to eat.. well, almost. I wish my hydrangeas looked this good... this summer has not been kind to them.